Register Log In ECN Forum Forums General Discussion Area Why the third prong? Why do stereo equipment need a grounding source at the receptacle? Is the grounding a absolute must for semi high end stereo equipment? And last but not least why do some manufacturers of equipment claim that without a proper or good grounding the equipment will not work. Why does stereo equipment need a grounding source at the receptacle? For the same reason any piece of equipment would require a ground- to eliminate the shock hazard should the case become energized. Is the grounding an absolute must for semi high end stereo equipment? Don't see what "semi high end" has to do with it (or even what it is). It's up to the manufacturer to design the equipment so that no shock hazard exists and if they can do that without a ground and still pass laboratory testing (such as UL) then they won't need a ground. And last but not least why do some manufacturers of equipment claim that without proper or good grounding the equipment will not work. Got me. They shouldn't be relying on the ground for any more than safety. Maybe they are trying to scare the customer into doing the right thing. Typically, grounding is a must in more-complicated audio setups where pre-amps, amps, mixing gear.....are used in conjunction with each other. They need to share a common ground, but even then, ground loops can happen, causing annoying hisses and hums. In some cases, they can be removed simply by REMOVING the ground from the offending source equipment. It's normally not safe to do this (especially with microphones and stage equipment), but sometimes the show must go on. Other times, adding a ground to an ungrounded system works. You typically don't see this sort of problem with a standard home system with 3-4 components and a main tuner/amp. Those grounds are usually just for shock protection (which is the reason for grounds in the first place). It's just that, in protecting people from shock hazards, grounds can cause odd audio problems in larger systems. Assume that the ground in home devices are just simply grounds. Ofcourse obviouse reason for grounding is for saftey. But the equipment that my client has is around $4000.00 and the power cord is only two prong. I can not see the benefit of prividing him an additional grounded receptacle for his equipment. Why do manufactures of electronic equipment insist on a grounded circuit if the equipment is only two prong??????? The market for high end stereo is huge in places like Japan where they no doubt have different electrical systems than we do. Manufacturers might creat standards that can be applied regardless of system. Maybe that has something to do with it. My experience in Pro audio here (in the states) shows me it is common to utilize ground lifts to get rid of buzzing. Trying to use audio gear in old buildings with gounding problems is dificult, and it is just easier to use ground lifts than to fix the electrical systems. Not the best choice, to be sure. That's may be what he paid for it but it's only worth about $400. Why would they put a 3 wire cord and plug on it, it would cut into the profit. Where were those $125 gold plated Hubbell "audio grade" receptacles again? Manuacturers are famous for having instruction manuals that are filled with bad grammar. That might be what is happening here. If a piece of equipment has a metal case, it ought to have a three prong cord. Period. Apart from safety issues, many electronics use the ground as a 'neutral' for the tiny amount of power necessary to keep things 'warmed up' (for instant 'on') or allow them to function when the appliance is "off" (timers and photocells are some examples where this might happen). Now, the manufacturer may be confused between a "grounded system" and what you think of as a ground wire. A "grounded" conductor is what you think of as the "neutral" wire. Not every circuit needs to have a neutral...for example, American 220v devices, such as space heaters, are served by two "hot" wires that are out of time with each other. Contrast this with the typical Euro "220", where there is a 'hot' and a 'neutral.' This might be what the manufacturer is referring to. Assuming a product was bought in the US, came with a two-prong cord, and has a UL lable, you should be able to plug in without worry. I notice that the instruction manual for a lot of consumer electronics starts off with a couple of pages of safety instructions that are boilerplate that has little or nothing to do with the actual product. For example, I just grabbed the instructions for my Sony DVD player, and there's a section on outdoor antenna grounding--but the player has no antenna input! It's a player, not a recorder. I've seen much worse than this particular manual. What this long-winded discourse is getting to is that your customer may simply be reading the meaningless lawyerish in the front of the manual, and thinking that it actually means something. ... many electronics use the ground as a 'neutral' for the tiny amount of power necessary to keep things 'warmed up' (for instant 'on') or allow them to function when the appliance is "off" (timers and photocells are some examples where this might happen). I don't think so! That's a real stretch. There may be leakage but intentionally putting current on the ground (no matter how "tiny") would wreak havoc with GFI's and AFCI's wouldn't it. I also don't think the device would make UL or any other testing lab very happy either. There is no reason for it, the neutral is uninterrupted and available so what would be the reason for using the ground? Arguing UL with Renosteinke is kind of like telling Eric Clapton how to play a guitar, Hal. I also don't think the device would make UL or any other testing lab very happy either. 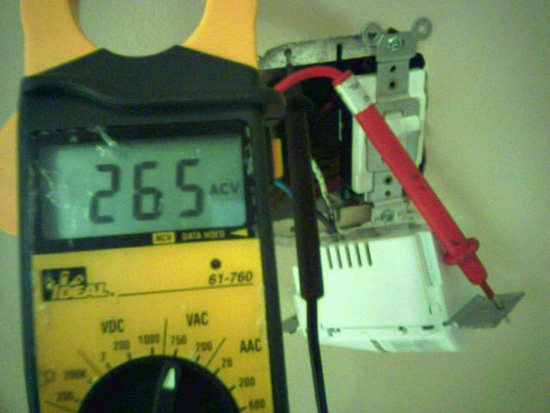 A listed occupancy sensor with the equipment ground removed--Test Points are device yoke, and grounded switchbox. REMOVING the ground from the offending source equipment. It's normally not safe to do this (especially with microphones and stage equipment), but sometimes the show must go on. Live entertainment is not good with dead performers. This is a very bad idea.